Based in Anaheim, rock n’ roll band Population U are competing in the Battle for Vans Warped Tour. The band is composed of Carlos (vocals/guitar), Juan (guitar/vocals), Julio (drums) and Paco (bass/vocals). Their mission is to bring fun catchy melodies back to the mainstream and to win their spot on the Vans Warped Tour. 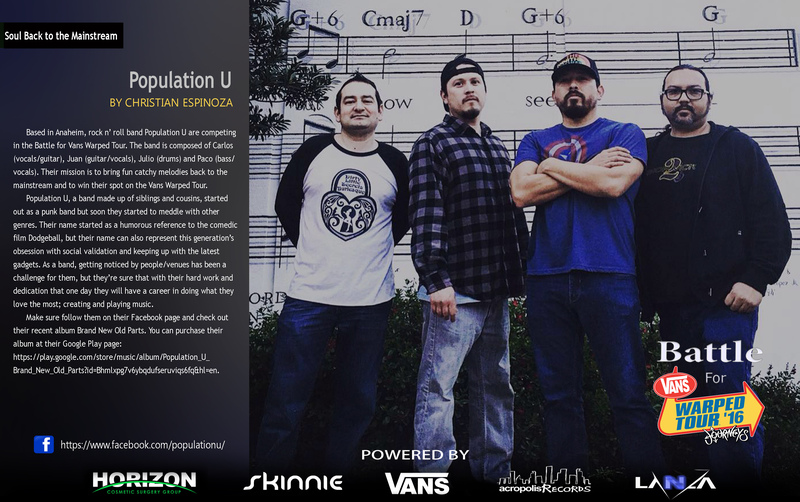 Population U, a band made up of siblings and cousins, started out as a punk band but soon they started to meddle with other genres. Their name started as a humorous reference to the comedic film Dodgeball, but their name can also represent this generation’s obsession with social validation and keeping up with the latest gadgets. As a band, getting noticed by people/venues has been a challenge for them, but they’re sure that with their hard work and dedication that one day they will have a career in doing what they love the most; creating and playing music. Make sure follow them on their Facebook page and check out their recent album Brand New Old Parts. You can purchase their album at their Google Play page: https://play.google.com/store/music/album/Population_U_Brand_New_Old_Parts?id=Bhmlxpg7v6ybqdufseruviqs6fq&hl=en.